The Besson New Standard Baritone Horns are designed to be durable hardwearing and responsive. Providing professional quality and an affordable price tag this Baritone horn produces a rich full sound with good intonation perfect for the developing player. It is lighter and smaller than other baritones and is therefore well suited to younger players. The Besson New Standard Cornet is finished in a bright silverplate and offers playing comfort easy response and good intonation. Ideal for beginners and advancing players the New Standard Cornet delivers a rich full tone thanks to the hand-made yellow brass bell. The Besson Sovereign Cornet continues to be one of the most highly regarded professional level cornets used within the brass band world today. They come as standard with a Gold Brass bell which helps provide a mellow tonal quality with plenty of focus. Now brass bands and demanding soloists can achieve the dark and full tone they desire. The Besson New Standard Baritone Horns were designed to be not only durable and hardwearing but incredibly responsive all at a budget price. Providing the quality of professional instruments at a budget price this Baritone horn produces a rich full sound with good intonation which complements as well as aids the developing player. It is also lighter and smaller than other baritones and is therefore more suited to younger players. The Besson New Standard Tenor Horns were designed to be durable hardwearing and responsive. Providing the quality of professional instruments at an affordable price this tenor horn produces a rich full sound with good intonation perfect for the developing player. The Besson New Standard Cornet is finished in a clear lacquer and offers playing comfort easy response and good intonation. Ideal for beginners and advancing players the New Standard Cornet delivers a rich full tone thanks to the hand-made yellow brass bell. The Besson New Standard BE152-1-0 Tenor Horn are designed to be not only durable and hardwearing but incredibly responsive all at a budget price. 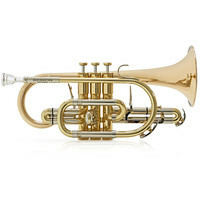 Providing the quality of professional instruments at a budget price this tenor horn produces a rich full sound with good intonation which complements as well as aids the developing player. The Besson Sovereign BE928G-1-0 Cornet continues to be one of the most highly regarded professional level cornets used within the brass band world today. It comes as standard with a Gold Brass bell which helps provide a mellow tonal quality with plenty of focus. Now brass bands and demanding soloists can achieve the dark and full tone they desire. The Besson Sovereign BE950-2-0 Tenor Horn boasts one of the most innovative horn designs for generations making it one of the most highly regarded professional level tenor horns used within the brass band world today. It is supplied with a Yellow Brass bell which helps provide a mellow tonal quality with plenty of focus. The quality of this instrument is guaranteed through the use of the finest raw materials strict manufacturing conditions and extensive expertise.